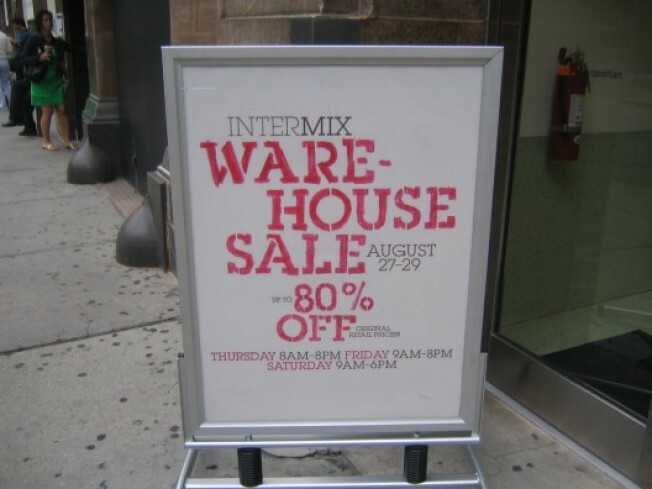 Attention bosses: Your fashionable female staffers may have been late for work this morning, as the Intermix Warehouse sale kicked off at 8:00am sharp. The warehouse sale offers discounts up to 80% off retail prices; there is also a buy-5-items-and-get-the-6th-for-$1 offer. First, hit the small designer section organized by designers, including See by Chloe, M Missoni and Stella McCartney. Zac Posen and Proenza Schouler were listed, but we only found a few items. A good number of designer items are under $200. The main section offerings are mostly spring and summer items—lots of silk party tops, dresses, shorts and summer sandals (starting at $29 for Jeffrey Campbell gladiators). We spotted a couple good investments for fall, such as a silk/cashmere GOLDE grey and plum shawl cardigan for $49 (from $285). There is a denim section with good deals on Stella McCartney, J Brand, Current/Elliot and Siwey. Most jeans sell between $49 to $99 in sizes from 24-31 and in various washes and styles.